Fort Moultrie. Lithograph by Currier & Ives. This year marks the 150th anniversary of the commencement of the American Civil War, and during the next few years there will be countless commemorations, memorials, and reassessments of the conflict’s many battles and events. The clash that famously opened the devastating conflict was the Battle of Fort Sumter. On April 10, 1861, Confederate General P. Gustave Toutant Beauregard, commander of the provisional forces in Charleston, demanded the surrender of the Union garrison at Fort Sumter. 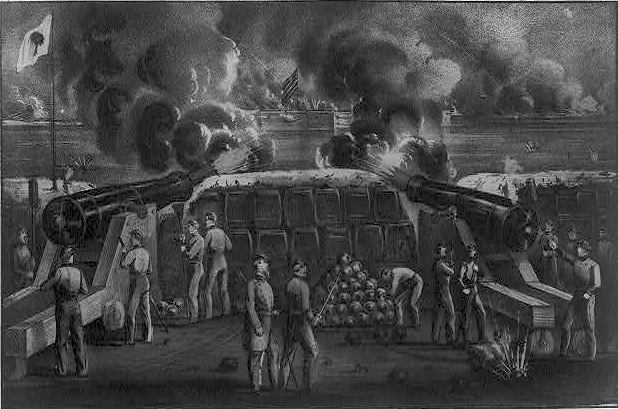 After Major Robert Anderson refused, Confederate batteries launched their attack on April 12, the garrison capitulated the next day, and the fort was turned over to Confederate forces on April 14. The battle itself was “bloodless”—although an accidental cannon explosion after the ceasefire killed two Union soldiers and wounded two others. Famous for his coverage a decade earlier of the Crimean War, London Times correspondent William Howard Russell covered the first year of the American war and gathered his account in My Diary North and South (1863). He arrived in Charleston three days after the surrender and traveled out by boat to see the ruins of Fort Sumter. 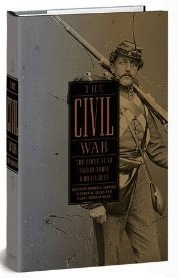 His diary entry for the day chronicles his tour of a jubilant city and includes astute observations of unruliness and disorderliness among the volunteer Confederate forces—including most memorably the drunk, self-appointed Confederate colonel Louis T. Wigfall, a Senator from Texas who had, without authorization, rowed out to the fort to accept Anderson’s surrender, negotiating terms that had not been approved by Beauregard. The following is Russell’s journal entry for April 17, reprinted in the forthcoming anthology The Civil War: The First Year Told By Those Who Live It (which has just this week arrived from the printer). April 17th.—The streets of Charleston present some such aspect as those of Paris in the last revolution. Crowds of armed men singing and promenading the streets. The battle-blood running through their veins—that hot oxygen which is called “the flush of victory” on the cheek; restaurants full, revelling in bar rooms, club-rooms crowded, orgies and carousings in tavern or private house, in tap-room, from cabaret—down narrow alleys, in the broad highway. . . . If you don't see the full story below, click here (PDF) or click here (Google Docs) to read it—free! I was interested in the sentence of what was found the most surprising by the author at the fallen Fort Summer: a letter copying-machine, a case of official stationery, and a box of Red Tape. These items continue to grow in our government today.